Nature protection has been identified as one of the key challenges facing Ireland in a major new report on the state of the country’s environment released by the Environmental Protection Agency (EPA) in Dublin today. Launched by The Minister for the Environment, Community & Local Government, Mr Phil Hogan, T.D., the EPA’s fifth ‘State of the Environment Report’, Ireland’s Environment 2012: An Assessment is the most comprehensive evidence based assessment of the environment conducted in Ireland. Produced every four years the State of the Environment report collates data from the EPA and other bodies to deliver a snapshot spanning all key aspects of Ireland’s environment in a single document. “The EPA ‘State of the Environment Reports’ are important milestones for Ireland. They provide a snapshot of our environment at a point in time as well as tracking trends and changes in the environment,” said Laura Burke, Director General of the EPA, speaking at the launch. From a nature protection perspective the report reveals that in Ireland, only 7% of habitats and 39% of species that are listed under the EU Habitats Directive are considered to be in a favourable state, but that full implementation of the National Biodiversity Plan (2011– 2016) will help protection of biodiversity for future generations. 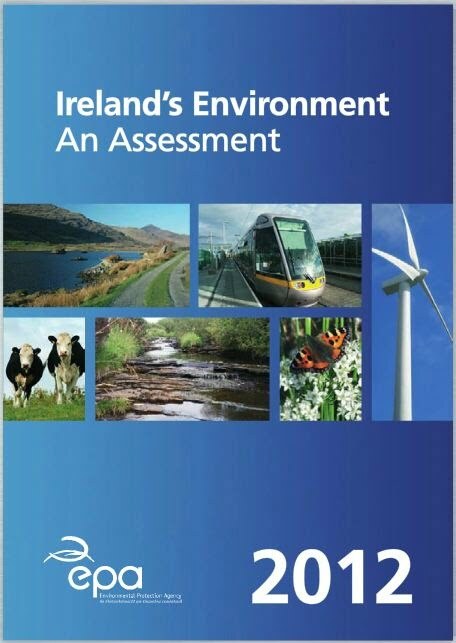 You can read the full report below, or download Ireland’s Environment 2012: An Assessment from the new EPA website which will provide the public and decision-makers with regularly updated information on key environmental indicators.